This entry was posted on December 28, 2011 by Russell Smith. 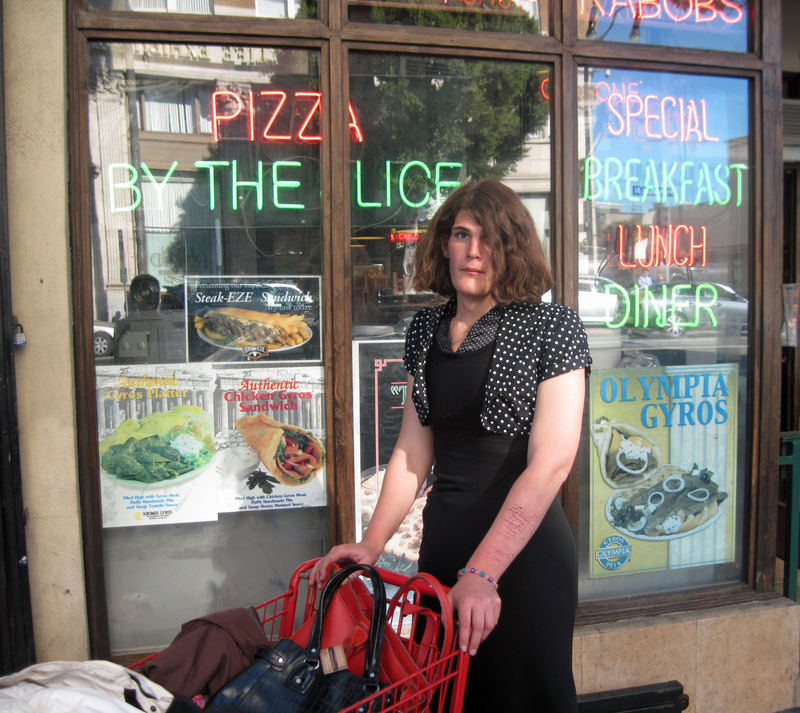 It was filed under Street, Urban and was tagged with cross-dresser, cutting, homeless, postaday2011, Russell Smith, self-mutilation, shopping cart, transvestite. even in madness, christy could always find the appropriate bolero jacket. I noticed the self-mutilation first. Hmmmm….. how’s she doing? Do you know? I’m sorry but I don’t. I approach people on the street and tell them who I am and ask if I can take their photo. She said she was trying to get into a hospital and said she was meeting a friend to take her there. I told her how to get to Cedars Sinai on public transportation. Sadly all we can do is pray for some people. I noticed the scars, too and it is sad. You are right, Russell all we can do is pray. It really is amazing the photos you capture, but some of the stories must be difficult hearing. It is difficult but I think it goes with the territory. I do my best not to be callous and to comfort people who are receptive to it. In a sense, I think that can be said of everybody. Most people feel inadequacies that others would never even guess they carry. At least she has a couple extra purses. I’ve come back to this photo a couple of times – she is haunting in so many ways. Nothing could make me happier than that statement, Jo. It means that my work has made an impact on you. Thank you so much! A picture is worth a thousand words. This is a story in a frame. Every person has a reaction to this woman’s struggle. I see sadness, pain, beauty and even a glimmer of hope. There’s a lot of compassion in your photography. I love it. Wow – I love this pic. Great work ol buddy! Thanks, Spunkster! I think it is one of the best I’ve ever taken. If you look closely, and examine it in detail, you will see many interesting things in the photo, some amusing, some quite sad. it’s funny how perception and preconceived notions alter the emotions attached with an image. I don’t know Christy and didn’t know anything about the person or self-mutilation- this is the first time seeing this, and I don’t feel sadness at all. I see wonder and curiosity in Christy’s eyes- a moment captured in time. I have built a homeless website for my community’s homeless shelter; I’m learning by now that some people truly WANT to be homeless, despite our lifelines- others so not know they need help. and i was just curios if you get a lot of spazm responses? If so how do you stop it, any pougin or anything you ccan recommend? I’ve heard other say that they get hit with a lot of spams. I only get them now and then. I’m sorry but I can’t offer you any advice on this issue. obtain latedt updates, therefore where can i do it please help.